Unoaked and dry, this California style white wine is light and fruity. Pairs well with salmon and roasted squash or garlic bread and crab cakes. 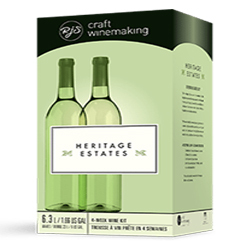 This package includes one batch (23L) of Heritage Estates wine, corks, 30 green bottles, labels, shrink wraps, all fees and taxes. Your savings: $24. This is a limited time deal. Some restrictions apply. A refreshing, medium-bodied, dry Sauvignon Blanc style wine with crisp, green apple flavours and pleasant herbal notes. Unoaked.Perfect with light seafood dishes or white meat. A balanced classic Cab style wine with berry, toast and vanilla aromas and berry flavour with well integrated oak.Try it with meatballs or lamb chops. A medium-bodied and dry Merlot style wine with aromas of tart strawberry and flavours of berries with light floral notes and a short clean finish. Pairs well with Shepherd\'s pie or beef stew. This package includes one batch (23L) of Heritage Estates Pinot Noir wine, corks, 30 green bottles, labels, shrink wraps, all fees and taxes. Your savings: $27. This is a limited time deal. Some restrictions apply. A dry and light-bodied wine with crisp acidity and very little tannin; plenty of fruit flavour with some cherry and red berry notes. Serve with pasta and roasted vegetables or grilled eggplant. A Shiraz style with fruity aromas of ripe raspberry with floral and spice nuances; dry and full-bodied with balanced acidity and soft tannins. Tastes great with barbequed meats or pizza. A traditional, unoaked French style red wine with spice and berry fruit aromas, rich berry fruit on the palate and spicy notes in the finish. Enjoy with a heavy meat dish or wild rice and mushroom salad.